Happy Leap day everyone. A whole extra day this year. We should all try to come up with something fun to do! I am planning to work on a secret justjohanna project! Its a little out of my comfort zone - but I think that will be part of the fun! Just a quick reminder that today is the last day to enter to win the card kit blog candy. Just leave a comment on this post before midnight eastern time tonight. This is a quick card I made for my cousin's son who is in the hospital. We are all hoping and praying for a quick recovery. The inside is a pop-up. I don't know if he likes frogs - but it turns out I have very little to use for teenage boys. Hmmmm..... maybe I need to shop! this card is fantastic, sure it will put a smile on his face, will keep him in my prayers. 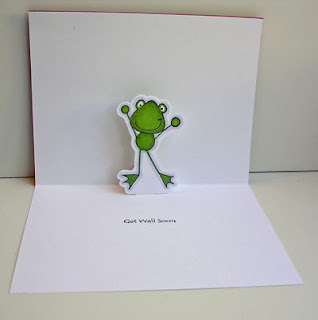 I love your little froggy card! I think it will be perfect! 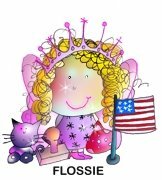 It's really cute and sure to bring a smile! Adorable card! 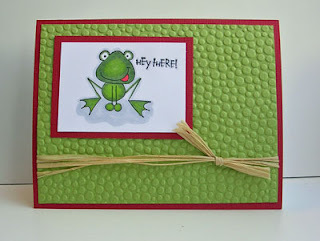 I love the way you colored the froggy and how fun to have a pop up inside! It's sure to brighten his day. This is such a cute card!!! I love this card! The CB embossed background matches the froggie image so well! The pop up frog is so cool! Such a fun card!! what a hoppy (happy) card. this should definitely brighten the little guy's day up a bit. Prayers for a speedy recovery! Another great card!! Those frogs are adorable. I don't remember seeing them at MissyB's....might have to relook there! What a fun card! Love the pop-up element. LOL!! what a cute card!! Made me smile!! This is SUCH a cute card! Oh my, this is adorable! I love it!